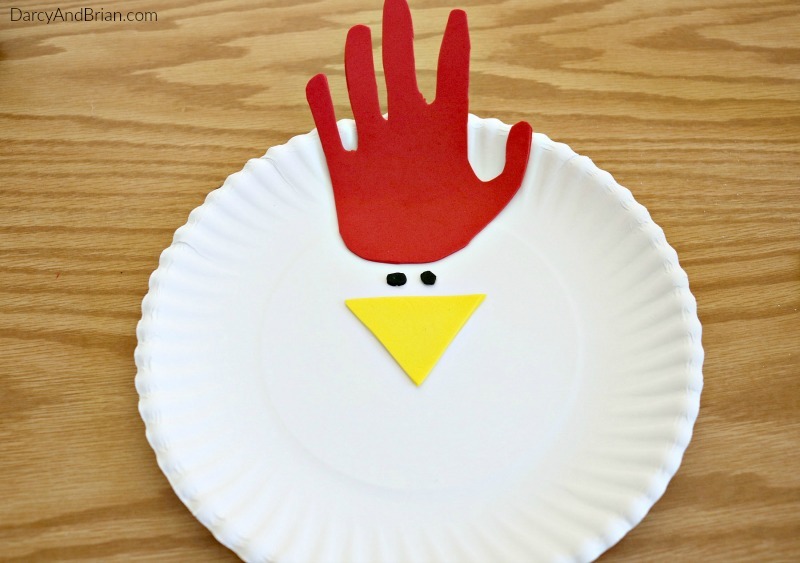 One of the easiest types of activities to set up for the kids is a paper plate craft. I almost always have paper plates on hand, making it one of the handiest craft supplies ever. 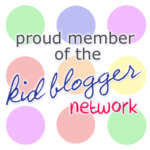 It's also important for me to find activities both my preschooler and toddler can participate in together. 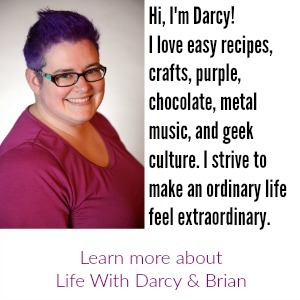 Some days a more involved crafting project works, but those generally require more prep from me. 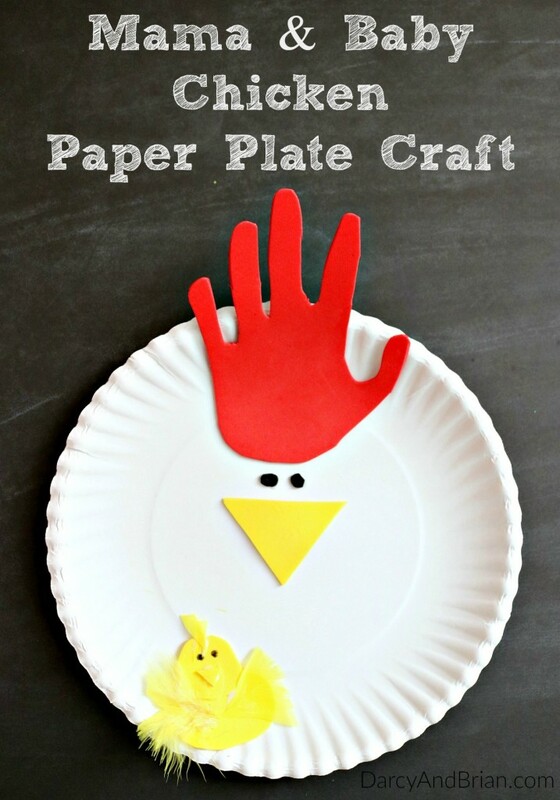 This chicken paper plate craft is pretty easy to set up and invite the kids to create. 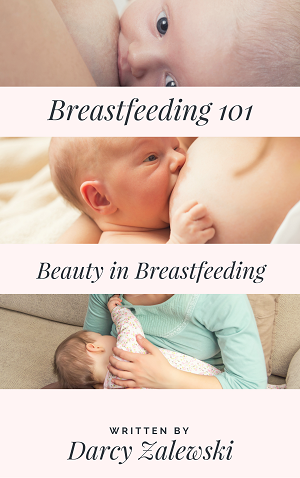 Some people look at a paper plate and only see it as a way to serve food, but it can be so much more than that. With a little glue, markers, feathers, and craft foam it can become an animal! 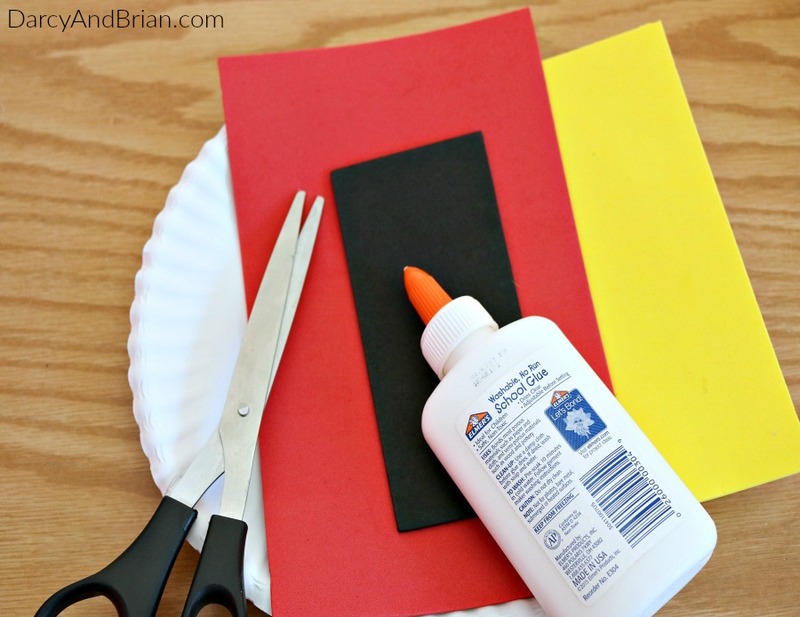 If you don't have any craft foam on hand, you can substitute it with colored construction paper. I like using craft foam sometimes to give the kids a different texture to work with. 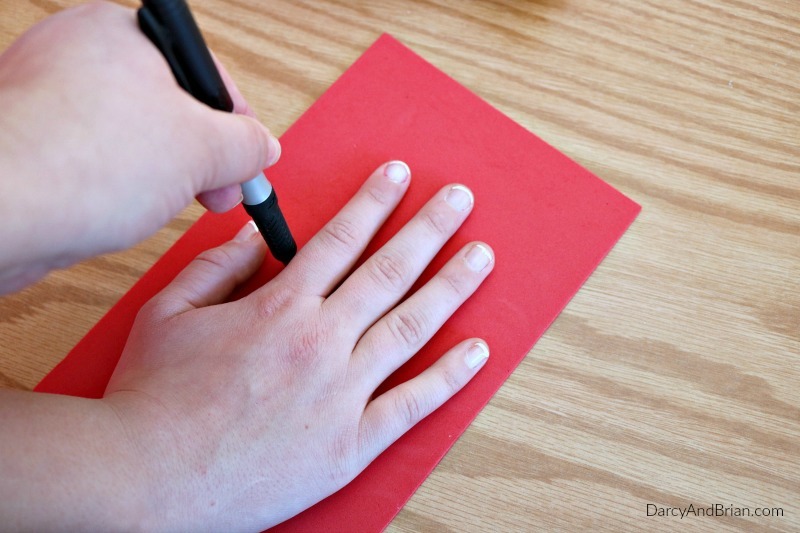 Older children can practice tracing their hand and work on their scissor cutting skills. For younger kids, you can pre-cut everything and let them do all the gluing. I swear, using the glue was always my kids favorite thing to do when they began crafting. Make up stories about the mama hen and baby chick, sing Old MacDonald Had a Farm, or read a book about chickens to expand this kids spring craft into a fun learning activity. Draw or pre-cut a large yellow triangle for the hen's beak and glue it in the middle of the plate. Then draw or pre-cut two small black circles for the hen's eyes and glue them above the beak. Now mama hen is done! Pro Tip: Go ahead and cut out several triangles and circles while you are working on this project. Keep them in a storage bag for use in a future craft activity! For the baby chick, cut out one large yellow circle for the body and one small yellow circle for the head. Glue the baby chick's body onto the bottom or side of the paper plate so it looks like the little chicken is snuggled near its mom. Then glue the yellow feathers in place on the baby chick. Add a little yellow triangle for a beak and use a black marker to draw little eyes. 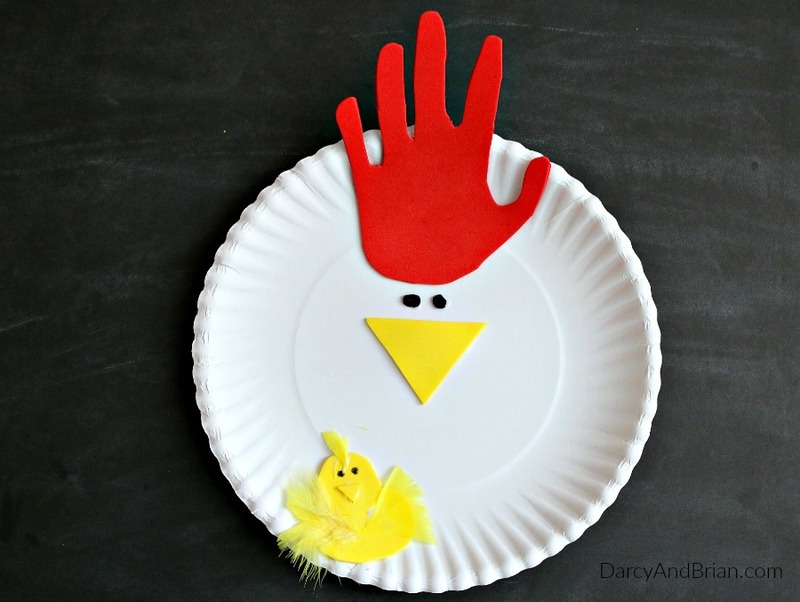 This hand tracing chicken paper plate craft is a great way for kids to work on their tracing, cutting, and gluing skills. 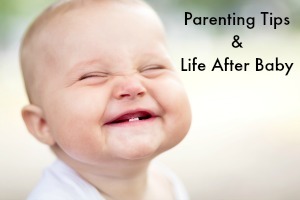 It's also a simple, yet fun kid activity. They'll have fun making chickens with you while you sneak in learning about colors, shapes, and even animal noises. 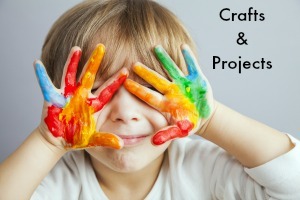 Don't miss out on our other great kids crafts!